Full Steam Ahead - "A Single Word ... "
I love have an actual book in my hands on a regular bases. They cocoon me in the paper scent that books tend to have. This book I enjoyed very much while I read it with my meals, with it light-heartiness made me smile at times as I could picture Darius’s disheveled stubbornness meeting Nicole’s determined and her considered forthright manner in many aspects of their lives. I would give this 4 out of stars. 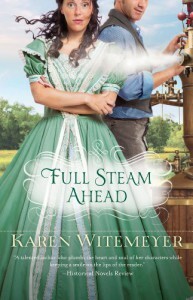 Karen Witemeyer is a relatively new author for me (2nd book read), I look forward to reading more by her.